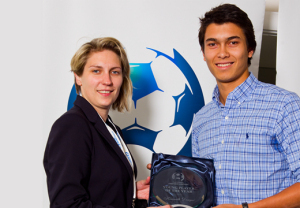 Brisbane City midfielder Ken Dougall says he will be back to challenge for silverware next year after being honoured as the 2013 NPL Queensland Young Player of the Year following an outstanding season in the heart of midfield. Dougall, who was previously a member of Brisbane Roar’s National Youth League squad, received his award on Saturday evening prior to the National Premier Leagues Semi-Final featuring City’s Grand Final opponent, Olympic FC. The bitterness of defeat in the season decider was still apparent for the 20 year old (pictured receiving his award from Football Federation Australia’s Emma Highwood), who promised City would be better for the experience next year. “Obviously nobody likes to come second. It’s been a successful year nonetheless, but we definitely want to win the league and the grand final next year,” Dougall admitted. “Now that we’ve got semi-final extra time and grand final extra time experience, it’s got to help in those big game situations,” he predicted. Ever the team man, Dougall was quick to praise his club and teammates for his award following an industrious season that saw him net four goals, including a match-winning strike against Sunshine Coast Fire in City’s dramatic semi-final win. He also praised the National Premier Leagues competition as a whole and the state-wide model implemented by Football Queensland. “As a new league it was very competitive and well organised. It was exactly how they planned it,” Dougall enthused. “I think it’s a great stepping stone for players that want to progress to the A-league,” he concluded. While admitting he is yet to finalise his plans for the summer, Dougall said he had every intention of donning City’s famous sky-blue kit again next season. “At this moment in time, definitely I will be back,” he asserted.